For decades, left critics of the International Monetary Fund (IMF) have maintained that the IMF is merely a tool for enforcing the interests of financial elites, especially those in the US. Predictably, this view has been scornfully dismissed by those in power and their media lackeys who posture the institution as the benefactor of needy countries. The persistent history of the IMF’s extortionate funding, linked to austere cuts in social spending, is simply dismissed as pressing fiscal responsibility on countries lacking the spine to address their profligacy. Such are the myths that sustain faith in global capitalism. 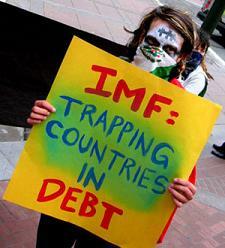 But a close look at the IMF in action reveals the politics lurking behind its high-sounding mission statements. Consider the recent encounter between the IMF (and EU representatives) and the newly elected Hungarian government. After the conservative Fidesz Party won the April elections, leaders showed a spark of economic populism by refraining from deep cuts in social spending to reach its European Union-established goal of a deficit of 3.8% of GDP. Instead, Fidesz ministers planned to enact a financial transaction tax that would lower the deficit with additional revenues. This did not please IMF representatives, despite the fact that Hungary had been the poster child for fiscal responsibility by pulling itself back from the brink of insolvency through four years of extreme, painful cuts in government spending. The social democratic Hungarian Socialist Party – the previous ruling party – imposed extreme austerity on the public sector in order to curry favor with the IMF, a prize that was won in late 2008 with the awarding of a $26 billion loan. When the brakes were applied, the deficit (expressed as a percentage of GDP) shrank from nearly 10% in 2006 to under 4%, an extremely painful process, but one that exceeds in intensity the experience of any other European government. In short, Hungary currently comes closest of any of its European neighbors to the guidelines established by the EU and the IMF for fiscal responsibility. Nonetheless, when the Hungarian government negotiated with the IMF and EU in mid-July in order to draw the remainder of the 2008 loan, the IMF abruptly withdrew from the meeting charging that Hungary was doing too little to reduce its deficit. Honest observers could not help but be puzzled by this action, given Hungary’s stellar performance in jumping through IMF hoops. Immediately, the currency, the forint, dropped in value, the Hungarian stock market dropped 3%, and the cost of insuring the debt leaped up. Clearly, financial markets were punishing Hungary for being good. One banking executive, quoted in The Wall Street Journal, commented that things are going to “get pretty ugly.” The European commissioner for economic and monetary affairs threatened that Hungary’s “excessive debt by next year will require tough decisions, notably on spending.” But most telling, the IMF chief for Hungary, Christoph Rosenberg, described the measures offered to lower the deficit, particularly the bank tax, as “ad hoc,” according to the same WSJ article (7-19-10). Why should the IMF care how the Hungarians lower their deficit? More to the point, why is one policy prescription for curing the deficit – imposing government austerity – legitimate and yet another prescription – raising bank taxes – dismissed summarily as “ad hoc”? The IMF walk-out gives the lie to the notion that the organization serves nobly to reward fiscal responsibility with generous help to struggling national economies. Instead, the IMF, central banks, and policy makers use debt levels and rising deficits to extort reductions in socially beneficial spending in the public sector. When Hungary reduced pensions and benefits, raised the retirement age, sliced subsidies, and denied wage increases, it was deemed prudent and deserving of a loan. But when the financial sector was asked to bear some of the burden of deficit reduction, the IMF condemned Hungary’s government and walked away from the negotiating table. IMF officials assuredly knew that Hungary would be punished for its defiance, unleashing the predatory financial sector to batter currency exchange rates, equity values, debt costs, bond ratings, and insurance costs. Hungary provides a rare, naked exposure of the insidious, hypocritical use of debt extortion to dismantle the hard-won social safety net. Throughout Europe, this strategy has spread like a plague – a plague on working-class standards of life. From Greece to Ireland, from Spain to the UK, from Portugal to France, the financial oligarchy has hammered the fiscal health of nations, raised hypocritical fears of debt and deficit difficulties, and assaulted policies, institutions, and programs benefiting the majority of the citizens. And of course – thanks to a compliant media and parrot-like economic gurus – the unwarranted, but fearsome, threat of unmanageable debt has washed upon US shores. The end game of this charade is two-fold: First, it seeks to put the burden of debt reduction squarely on the backs of working people. All the debt accumulated by endless wars, bloated militaries and security services, tax relief for the rich, and corporate welfare and bailouts is shifted to the masses. Those sincerely concerned with rising debt should look elsewhere. As Jack Rasmus points out in his new book, Epic Recession, the largest portion of total US debt over the last decade was located in the financial arena; less debt was held in the mortgage and consumer category; roughly the same amount of debt as household debt was found in the non-financial corporate sector; and the least share of all was on government balance sheets. Moreover, household and government debt has shown less growth before 2009 than either non-financial or financial corporate debt. So for those obsessed with the rising debt, their attention could profitably be focused beyond government spending and towards those in the corporate club responsible for the excessive borrowing that enabled the current crisis. Secondly, the offensive against government support for human needs is a direct attack upon labor costs. By stripping working people of any guarantees beyond the very minimal for survival, the debt ruse creates fear and desperation on the part of unemployed workers, marginally employed workers and those with little or ineffective organization. Without a safety net and in the face of growing uncertainties, employees opt for wage and benefit concessions or accept working conditions far below what they otherwise tolerate. The destruction of collective goods further impoverishes working people along with the extension of their working life through the advancement of the retirement age. If the winning of the 8-hour day was one of the monumental victories in the class struggle under capitalism, the extension of the working lifetime – with the increase in retirement age – is an equally devastating setback. Thus, the debt scam is quite simply the classic logic of increased labor exploitation carried on by means of financial hypocrisy. It should not be overlooked that the financial weapon wielded by the European (and US) ruling classes demonstrates both the dominant power and continued unfettered, free-wheeling play of the financial sector. Despite all the talk of re-regulation and oversight, financial activity remains arrogantly aggressive and highly speculative. Undoubtedly this underlines the absolute victory of the financial sector – as Lenin predicted – in capturing the leading role in state-monopoly capitalism. Both the crucial part played by the financial sector in electing the US President – the largest contributor to the campaign coffers – and the leadership that the sector’s representatives enjoy crafting economic policy only amplify this point.